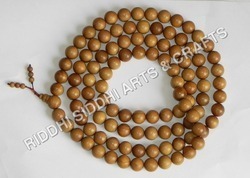 Prominent & Leading Manufacturer from Jaipur, we offer sandalwood mala beads, buddhist rosary beads, chinese prayer beads chinese religious sandalwood beads, sandalwood beaded bracelet, sandalwood beads and sandalwood jewelry. 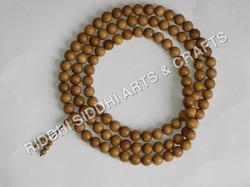 Sandalwood is one of the traditional materials used for chanting Beads and INDIA is the most popular for sandalwood over the globe the world’s best quality of sandalwood found in India only. It is said that sandalwood from Malayagiri Mountain is the superior most quality of sandalwood in world it is called now MYSORE. 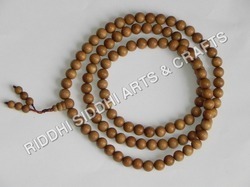 A soothing, peaceful and fragrant wood from India it is said to attract positive subtle vibrations, bring clear perception, promote tranquillity and a positive frame of mind.Sandalwood is an antidepressant, antiseptic, insecticide, and sedatives wood. It can assist in the healing of cells and is used to assist the immune system in any healing process or to prevent illness. 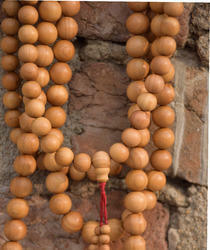 Sandalwood Mala known by many other names like:-sandalwood mala beads, sandalwood mala prayer beads, yoga sandalwood mala, sandalwood rosary, sandalwood rosary beads, Buddhist rosary mala, Japa Mala, prayer mala beads, Hindu prayer mala beads, Tibetan prayer mala, 108 Japa mala beads, meditation mala beads, Buddhist meditation mala and Mysore sandalwood beads etc. handicraft items offered by us are especially carved by our master craftsmen so as to provide in these close resemblances to the actual animals as well as make these provide an enchanting finished appeal. These carved animal pieces can also be made available in painted color schemes so as to make these resemble the actual creatures as closely as possible. The exclusive and sophisticated finish provided also makes these animal carvings an exciting gift option. Size - 6 mm 7 mm 8 mm 10 mm 12 mm 15 mm 18 mm 20 mm etc. 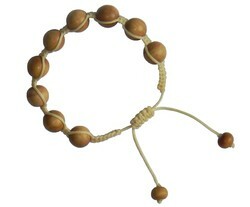 Sandalwood is one of the traditional materials used for chanting Beads. And INDIA is the most popular for sandalwood over the globe the world’s best quality of sandalwood found in India only.